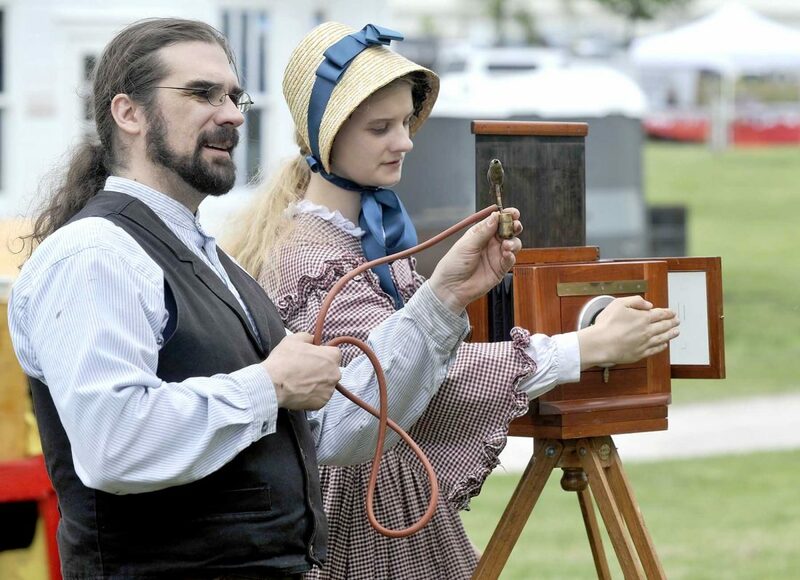 Chris Olsen, of Aurora, Illinois, makes noises with his 1880s era photographer’s birdie as his daughter, Louisa May Olsen, 15, uses her hand as a shutter during a three second tin type exposure during the 2018 Frontier Days at the Fort Museum & Pioneer Village. 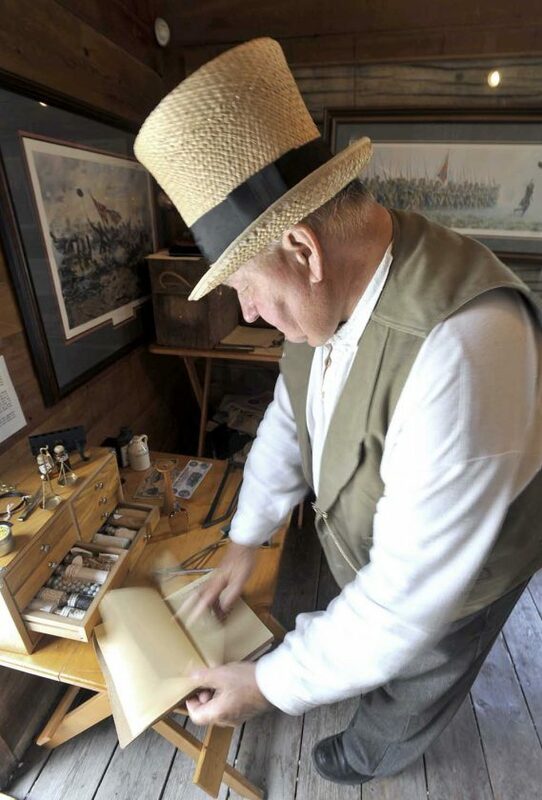 John Bonner, of Vincent, whose character is a frontier-era doctor, shows off his book of formulas during the 2018 Original Wild West Frontier Days at the Fort Museum and Pioneer Village. There’s a lot of events coming up soon at the Fort Museum & Frontier Village. The season is kicking off May 3-5. 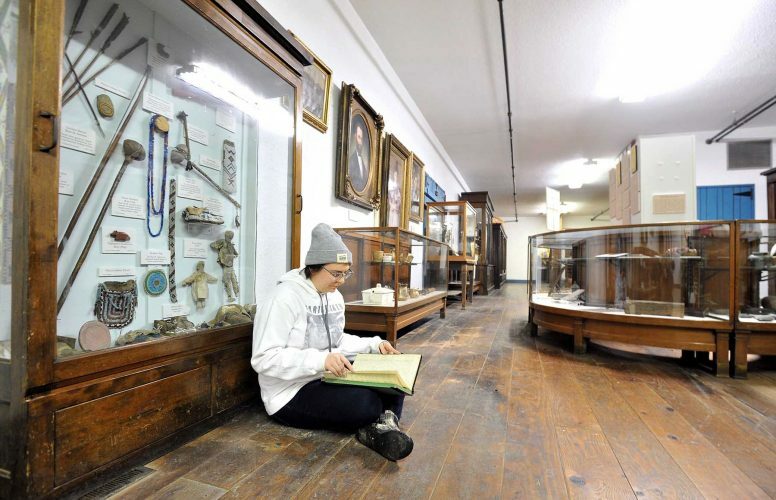 Misty Mackay, with the Fort Museum, said there will be a special event to start the season. Each participant is given a passport for their trek across the frontier. They might have a handicap, such as dysentery, or an asset like being able to read. The May 3 night session, from 6 to 9 p.m. will be held inside the stockade. The May 4 afternoon session, from 3 to 6 p.m. will be held on Frontier Street. The cost is $10 per adult, $5 per student with a student ID. Fort Members get in free. The Fort will also be hosting a series of Kids Summer Camps in the weeks following Frontier Days. The camps run for a total of five weeks. Each week is a different course of learning. The Fort is also busy preparing for its biggest annual event, Frontier Days on May 31, and June 1-2. Some of that includes a skillet throwing contest and a cooking contest on June 1 at 2 p.m.
“The public is welcome to watch,” she said. The annual parade is on tap for its 10 a.m. start time along Central Avenue in downtown Fort Dodge. Frontier Days hours are May 31, 4 to 11 p.m.; June 1, 10 a.m. to 11 p.m.; June 2, 11 a.m. to 3 p.m.